The other grizzly I ran across at Glacier was actually outside the park, a few miles from East Glacier. Back in September of 2010, as I was driving to Two Medicine Lake, a female and her frisky cub ran out in front of me. If I had left five seconds earlier I would have hit the bears. As I slowly passed by, the bear looked back at me, and then took off, her cub frantically trying to keep pace. 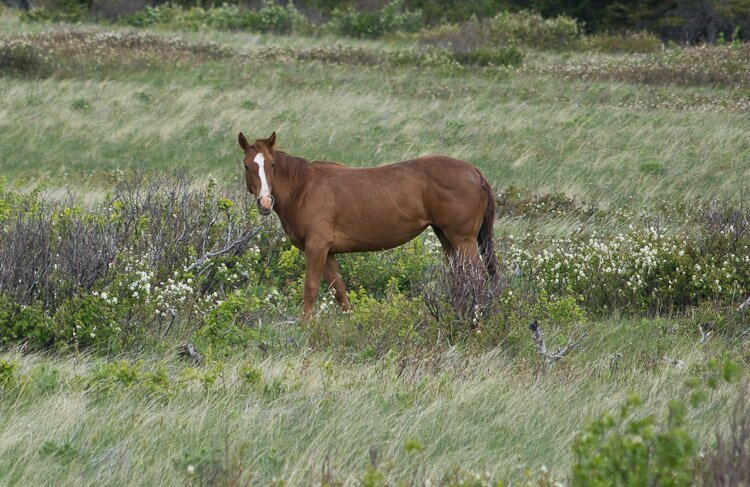 The horse was in the same prairie, several hours later, trotting back and forth. It is odd to see wild horses alone, doing the solo routine. It is particularly odd that this horse should have trotted over ten miles up Going-to-the-Sun road, only to turn around and come back. Where was the animal going? Why did he trot so far into Glacier National Park? There are few meadows that time of year to feed upon: just immense mountains covered with trees. The only explanation I can come up with for this odd behavior is that the horse was a raving lunatic, suffering from a form of equine psychosis.